Reason for inclusion: I had never seen a Rainer Werner Fassbinder film. Here’s a story that would have never happened if it weren’t raining one night in West Germany. Emmi Kurowski (Brigitte Mira), a 60-year-old widow, stops in at a local bar to wait out the rain on her walk home from work. She hasn’t had a drink in years, but she is drawn in by the exotic Arabic music heard inside. Upon entering, it’s as if time stops. The locals, mostly Arabs, stop and stare at her as she meekly takes a seat at the very first table. The server, Barbara (Barbara Valentin), slowly makes her way to the table, allowing Emmi to order a Coke. The bar patrons continue to snicker at the newest visitor, hardly hiding their disgust. One of the women in the group snarkingly suggests that one of them, Ali (El Hedi ben Salem), goes to ask her to dance. Much to her surprise, Ali takes her up on the offer, and even more surprising, Emmi accepts the dance. The two of them share a tender moment, and he offers to walk her home. It’s still raining when they arrive, so Emmi invites him in for coffee. She professes her loneliness since her husband died, and Ali shares his own similar feeling — his days feel empty, composed of nothing but work and booze. They bond, he stays the night. From here, they become a romantic couple, much to the surprise (and chagrin) of others. The age barrier is striking — there is at least a 20 year difference between them — but it’s the color of their skin that raises the most grievances. Ali is Morroccan, and during this period in West Germany, racism toward Arabs and other minorities is unfortunately commonplace. Foreign workers are “treated like dogs”, as Ali once states, and it is unfathomable to become romantically linked to one. Emmi’s own children, now adults with their own families, even frown upon her new lover. One of them, her oldest son, smashes her living room TV upon hearing their news. At work, Emmi’s cleaning lady friends banish her from their little gossip circle, forcing her to eat lunch on her own. Ali is treated like dirt everywhere he goes — the local grocer, despite Emmi’s loyal patronage for years, even refuses to serve him since Ali speaks broken German. It’s all quite sad, really, especially as the blatant racism is so in-your-face. Ali: Fear Eats the Soul tells the most unconventional of love stories, but it beautifully shows that love knows no bounds. Unfortunately, its other message is still as relevant today, as racism is still a global issue with no sign of going away. How much disrespect can one person take before they snap, or their body just can’t handle anymore? I’ve never heard of this but it sure sounds heart-wrenching. Thanks for bringing this to my attention, Eric! It’s a good one, Ruth. 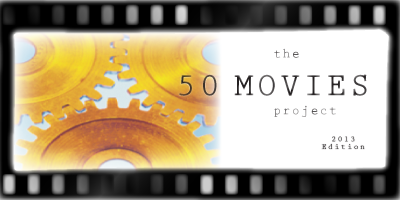 I hope this encourages more people to check it out. Good review! Indeed Ali Fear Eats the Soul  is an excellent film, been a few years since I saw it, so I’m due a rewatch. 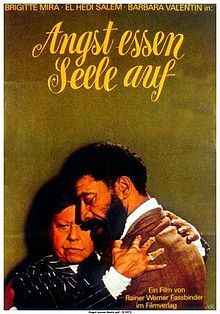 Actually for the making of it Fassbinder was influenced by Douglas Sirk’s classic All That Heaven Allows (1955), which has similar themes. Fassbinder just expanded on the theme to also include racism. Thanks! I’ll have to check out All That Heaven Allows, as well as more of Fassbinder’s work. Do you have any recommendations as to what to see next from his catalog? I watched the BRD Trilogy he did,which is worth a watch. 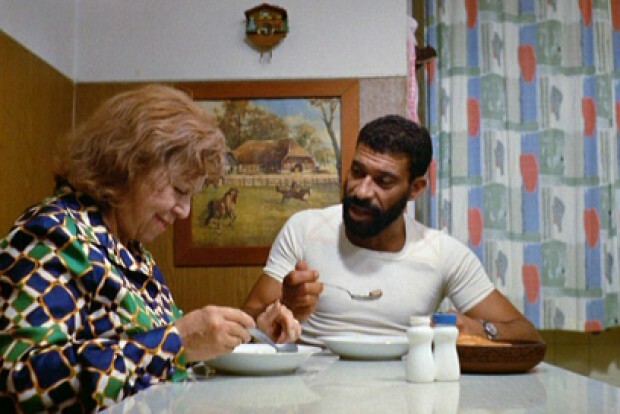 The first film, The Marriage of Maria Braun (1979), was my favorite from that. A couple of others, The Bitter Tears of Petra von Kant (1972),& Fox and His Friends (1975), I have heard are among his best, but I haven’t gotten to those two yet. Heh, yeah his large output is pretty overwhelming. I’ll look into the trilogy and the other two you mentioned — thanks, Chris!